This CO2 calculator has been custom designed to accompany Low Carbon Diet. Your last few payment statements from your electricity, natural gas and/or heating oil providers. The average weekly or annual miles driven in each of your household's cars. The mpg of all your household's cars. 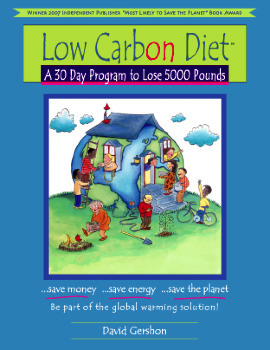 If you need help calculating this, see page 17 of the Low Carbon Diet workbook. The amount of airplane miles traveled per year. Click here to calculate distances between airports. Please Note: Calculator totals household usage, not individual usage. If you would like to know your personal calculation, simply divide the final total by number of persons in your household. If you are currently on a Low Carbon Diet team, please fill out the Calculator below, print out a copy, and bring it to your Team Building meeting. Note: If you close down your computer before printing your answers, you will lose all your data and have to begin again. It is best to set your browser options to not print background colors and images (or you may use a lot of colored ink). Please answer the questions below. If any questions do not pertain to your household, simply leave them blank. Enter your data CO2 emissions per year in Lbs. How many gallons of garbage do you put out each week? An average garbage can holds 32 gallons. On average, what is your household kWh usage per year? On average, how many therms of natural gas do you use per year? On average, how many gallons of propane do you use each year? On average, how many gallons of fuel oil do you use per year? On average, how many miles do you put on your primary car? What is the average gas mileage for your primary car? If you're unsure, assume your car gets 22 miles per gallon, which is about average. What is the average gas mileage for your second car? What is the average gas mileage for your third car? Based on your current lifestyle practices you are at level out of 10 levels (10 is the best). My goal is to reduce my annual CO2 emissions by pounds. If I reach my goal, I will be at level .